A USA Today insert in my Feb. 6 edition of the Desert Sun newspaper carried this story about the new tower under construction in Los Angeles. The news will be of interest to the concrete enthusiasts among our readers. A typical Tillotson elevator–for example, Albert City, Iowa–needed 2091 cubic yards of reinforced concrete. That’s just under one percent of what’s going into the 100-foot-deep hole on Wilshire Boulevard. I’m trying (without success) to picture 100 grain elevators compressed in there. The USC band will precede the first truck to the site. It is not recorded that any band ever marched to the opening of an elevator job. 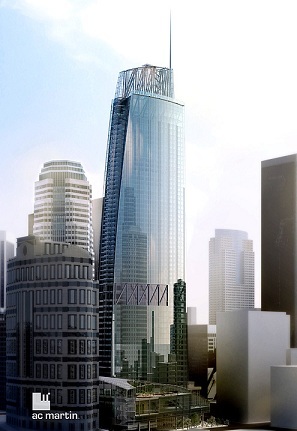 Nor is it believed a swimming pool topped any elevator, as will be the case at Wilshire Grand. Technical complications will arise during the pour, and a quite amazing means of addressing them has been devised, as you will read in the story. I mentioned all this to Uncle Chuck Tillotson and shared the clipping with him. He said that my grandfather Reginald had foreseen for Tillotson Construction Company a commercial future beyond elevator construction. Applying their expertise with concrete in different applications would only have been natural, but it’s doubtful he foresaw anything quite this big. And I’m sure he didn’t think about anyone taking a dip while 1100 feet above the city. This entry was posted in Other Companies, Reginald Oscar Tillotson, The Companies, Their Work, Tillotson Construction Company and tagged AC Martin, architecture, construction, grain elevator, slip-formed concrete, Tillotson Construction, Wilshire Grand.